Some girls love kittens. Some girls love dolls. Millicent loves tails. Everywhere she goes, she looks for materials to use in creating her wearable tails. While shopping with her mother one day, Millicent overhears other people deriding her tail. Will Millicent give up her tails to become more socially acceptable or will she discover that what makes her different can be her passion? 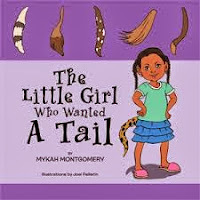 The Little Girl Who Wanted a Tail by Mykah Montgomery offers readers a charming story about accepting oneself, embracing differences and finding purpose. Coordinating illustrations bring Millicent's story to life and entertain even younger readers. I read this book to my sixteen month old. Although I am pretty sure she did not comprehend the themes in the story, I know she enjoyed looking at the illustrations. I feel the book could have benefited from an editorial service as I did notice some grammatical errors. However, I think the majority of children will either not notice or not care about these errors. Overall, I can recommend The Little Girl Who Wanted a Tail as a book with lovely illustrations and outstanding themes. Don't forget to check out the theme song for The Little Girl Who Wanted a Tail. The song is by the author's daughter! How awesome is that! Thank you for sharing The Little Girl Who Wanted a Tail with your network, Jolene. :-) Have a wonderful weekend.